Lido is a public beach, centrally located between Blue beach and Ruhl beach that contains Lido Plage private beach-restaurant. The public beach is small but wide and contains Nice's only pontoon, the last remnant of a Belle Epoque casino that was destroyed during WWII. 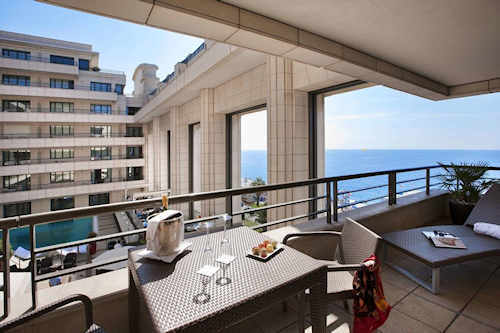 Lido beach is right in front of the luxurious five-star Palais Mediterranée. It's also an easy walk from the four-star Hotel West End , the Hotel Westminister and the splendid five-star Hotel Negresco. 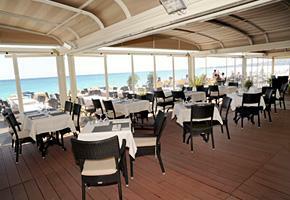 Across the Promenade is the cafe-restaurant, Sarao, which serves a full range of meals and snacks. Next door is Cane au Sucre, a casual snacks place. On the public beach, there's a portable WC in the summer. Naturally, Lido Plage has all necessary facilities for its clients. From June to September there's a lifeguard and first-aid station at Lido beach. See more about lifeguards. Parking on the street is extremely difficult here. There is a paid underground parking at the Palais Mediterranée. 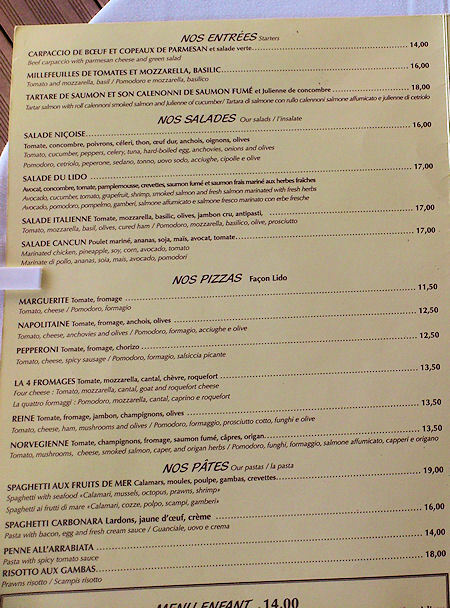 Lido Plage is known for its generous salads and reasonable prices (see my review). Note that this is one of the few beach-restaurants in Nice to offer a lower price for the second row of lounge chairs. All are comfortably outfitted with mattresses. See more about private beaches and beach-restaurants. Restaurant Opening Hours: Breakfast from 10am, lunch and dinner from mid-May to September. Lunch all year.